► Better than BMW or VW? 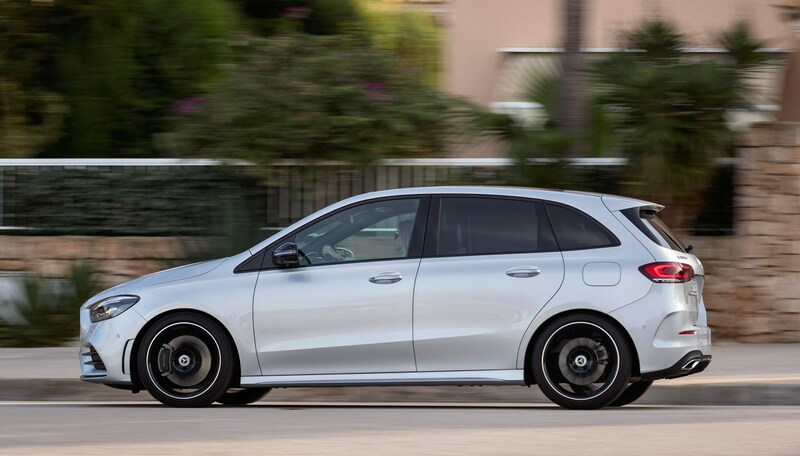 Roughly 1.5 million Mercedes B-class models have been sold since it took up the mantle as Merc’s small-but-tall car from the first and second-generation A-class models. 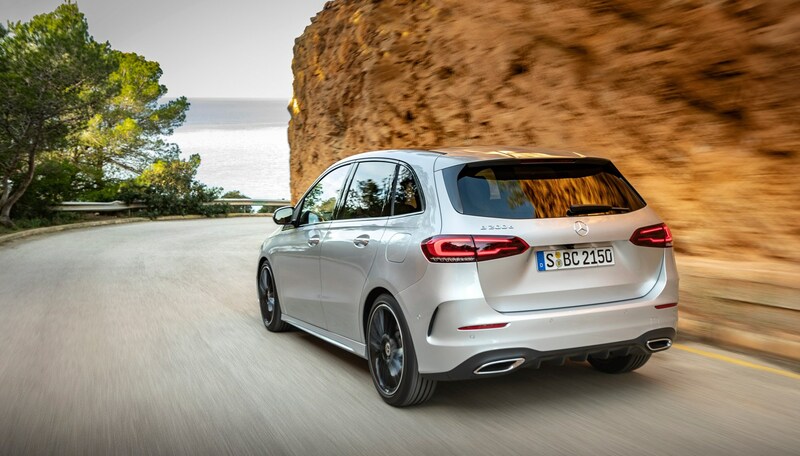 ‘What we’re talking about is a key premium model in the compact segment’, said Jörg Bartels, director of compact car development at Mercedes. Obviously, as it seems as if BMW in recent years wanted a piece of the posh compact family car action with its 2-Series Active Tourer, and we’re willing to bet the B-class is half the reason why the VW Golf SV still exists. Anyway, the new B-class has arrived within a year of the fourth-gen A-class, using the same platform underneath and many of the posh hatch’s features. And that’s far from a bad thing. 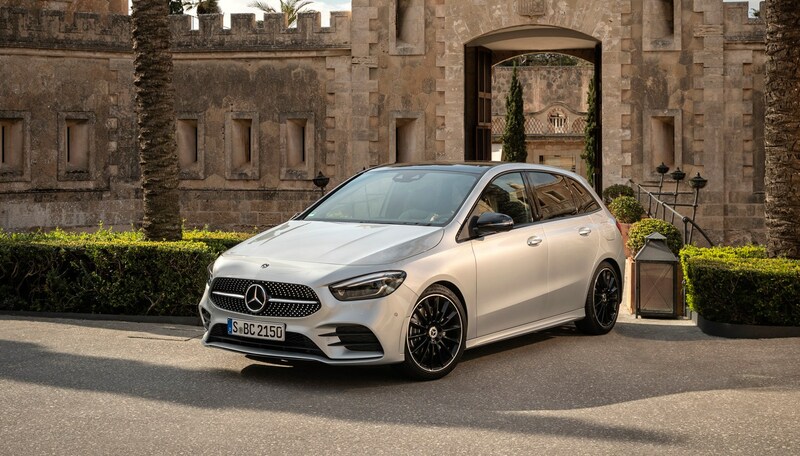 We really like the new Mercedes A-class at CAR and, like the previous one, this is a roomier and more family-friendly version of the premium hatch. Unlike BMW’s practical 2-series models, there’s no seven-seat option – you’ll have to get a new Mercedes GLE at the very least if you want seven seats and a three-pointed star. This one is 30mm longer than its predecessor, it has a longer wheelbase and is 10mm wider, too. Mercedes claims the B-class has the best drag co-efficient in its class, so stick that in your wind tunnel 2-Series Active Tourer. You sit higher up than in an A-class, with pedals that are angled more horizontally than its hatchback compadre and there’s an improved view out. Fairly standard mini-MPV stuff. Five powertrain options are available in Europe: B180 and B200 petrol variants and B180d, B200d and B220d diesels. The engines comprise a 1.3-litre 4cyl turbo with 135bhp and 161bhp in the B180 and B200, the B180d has a 1.5-litre diesel with 115bhp, while the B200d and B220d have a 2.0-litre diesel with 148bhp and 187bhp respectively. Although specs aren’t actually confirmed for the UK yet, we’re pretty certain they’ll consist of SE, Sport and AMG Line with the latter using multi-link rear suspension instead of a torsion beam. We had a go in a B200d AMG Line and B220d Sport that both feature a new eight-speed dual-clutch auto (the others use a seven-speed one). Would you be surprised if we said much like the A-class? Sorry. Well, there are a few differences; the steering isn’t quite as sharp as the A, like the rack has been wrapped up in a thin layer of cotton wool. It’s still direct enough, though, and body roll regardless of your suspension setup underneath is really well controlled. AMG-Line models have a lumpier ride due to the larger wheels but it was acceptable. We'll have to double check if that’s the case when we drive a B-class on truly rubbish UK roads, rather than Mallorca’s near-impeccable tarmac. A comfort-spec suspension setup and one with adaptive dampers will be available when we get finalised specification info. Motorway refinement is impressive even with the larger wheels equipped, and both the B200d and B220d are well-suppressed. In fact, on the AMG-Line model in Sport we noticed some speaker-enhanced engine noise designed to mask the slightly thrashy sound at high revs. Acceleration is smooth in both, to the point that they barely felt like diesels, with the B220d naturally having a bit extra punch. The B200d will be plenty enough for most. The additional gear actually helps the auto ‘box to feel a smidge less ponderous than before, and there’s also no first-gear lurching like some of our experiences with the A-class. It’s carried across almost wholesale from the A-class in here, albeit with some more bits of dashboard to tailor it to fit the more expansive cabin, which all looks the part. MBUX infotainment is standard, with the wider 10.25-inch twin screens available as an option. Augmented reality, which digitally transposes arrows and signposts onto a live camera feed when the nav is active is also available much like (shock) the A-class. Merc’s Energising Comfort system is also available, with a new feature that debuts here: Kinetic Seats. Basically, on longer drives the electric seats will adjust themselves (back tilt, thigh support, lumber height) every now and again incrementally to help keep your posture from staying in one position too long – something that’s meant to put less strain on your body. As for space, a 6ft 3in driver (me) can sit behind themselves and there’s enough headroom to climb in dressed as Carmen Miranda (which, frankly, I’d like to try at least once). We were surprised to find no sliding rear seats at launch – these will come available in mid-2019, as will a fold-flat front passenger seat. A flat load lip and low, wide boot aperture is really handy, as is a 40:20:40 split fold seat configuration in the rear. Oddly, the boot volume with the seats up, up to the parcel shelf, is 33 litres fewer (at 455 litres) than the outgoing model, while space with the seats folded flat is 7 litres fewer (at 1540 litres). That’s 13 litres less and 30 litres more than a 2-series AT, respectively. Pose factor will attract many small families to a B-class, and it’s far from rubbish to drive. It’s got a little more personality than a Golf SV and blows the 2-Series Active Tourer out of the water for interior wow factor and available tech. But we’d suggest waiting a while before putting an order down if you want maximum practicality points; some bonus handy interior features are coming a while after launch. Plus, we’re making a solid prediction that, when prices are revealed towards the end of 2018, it won’t be cheap.